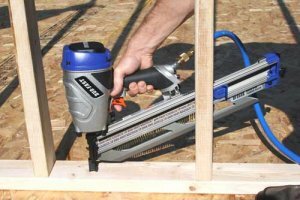 In the past, when you needed a 20 degree paper tape collated nailer, your choices were very limited, but now with the introduction of the Duo-Fast DF350S you have literally doubled your choices. As with most newer nail guns, the DF350S has all of the features you should expect, like tool-less depth drive adjustment and a dual trigger for both sequential and bump fire nailing (of course bump firing is the fun mode). A tool hook is also something I look for in my nail guns and the DF350S has one that you can hang on both rafters as well as your tool belt. The DF350S also features anti-dry fire, which is a mode that prevents the gun from nailing when it is almost out of nails. As mentioned earlier, the DF350S uses paper tape collated nails, which eliminates the flying debris and reduces the jamming, that occurs while using plastic collated nails. The DF350S is designed to use nails from 2" to 3-1/2" in smooth, ring or screw shank with shank diameters of .113, .120, .131 or .148 and can hold up to 70 nails at a time or two full 30-count strips.